Human Resources takes care of the most valuable asset of your company – its people.From employee hiring to employee exit, there are many responsibilities that HR managers must carry out smoothly. Similarly the challenges faced by HR managers are plenty. Unlike machines and financial resources, human resource is ever-changing and dynamic. 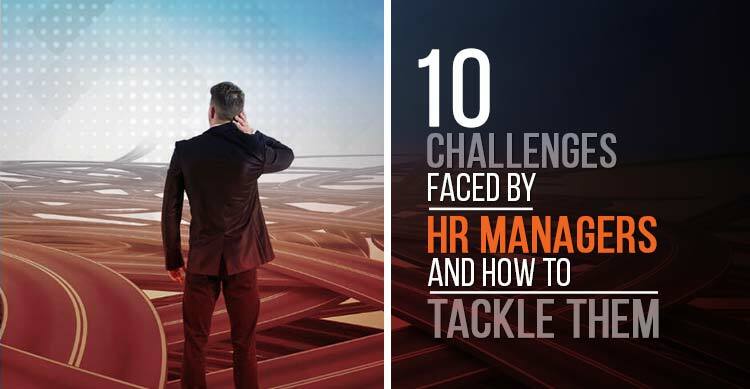 In this blog we will discuss the 10 most common challenges faced by HR managers and how you can tackle them. A motivated workforce is what separates a great companies from the average ones. According to Aon, current employee engagement levels were 65% in 2017. Thanks to growing focus on employee engagement, the number is only growing every year. In an era when each company is outdoing others in employee initiatives, you cannot be left behind. Employee engagement activities like events, contests, competitions and outbound activities are good ways. However this is not a sustainable way towards employee engagement. What happens when the employee comes back to his day to day job from a vacation? The key is to make sure you hire right people for the right job. People are engaged in tasks that are challenging and require learning. They like jobs that give them a sense of achievement and worthwhile results. Matching the job responsibilities and authority with each individual’s potential is the best way to ensure employee engagement in your organisation. Unlike the baby boomers, millennials easily switch from one job to another in their career. There are plenty of opportunities in the market for employees looking for a shift. In fact more than 80% of workers are either actively looking for a new job or are open to one (Ajilon). Loss of star performers and successful team leaders is one of the biggest challenges faced by HR managers. They not only have to deal with the the loss but look for a replacement and train the new hires. Sometimes the cost of replacement can be as high as the annual CTC of the position. Therefore, its best to retain your employees. How to tackle employee attrition? There are many tools and strategies to control attrition. Measures like, identifying employees with risk of quitting, open discussions, grievance redressal, regular and just appraisal are some of the ways to decrease your attrition. Use data analytics to identify attrition trends and patterns in your organisation. This will give you a list of high- risk employees you should focus on. According to Udemy, nearly half of employees said they have quit a job because of bad manager and 60% think managers need managerial training. Poor managerial skills is closely linked to attrition and poor culture. Leadership training is the obvious answer here. Another way is to launch a mentor-ship program for your managers so that they can learn it from the best in your organisation. Also Read : Why Is Organizational Planning Important For Your Business? Change has always been a part of business no matter what your industry is. With the digitalization of all processes the rate of change has become rapid. Agile companies adapt to this change quickly and become market leaders. For many companies driving change among its employees becomes a challenge. Humans are naturally resistant to change and do not want to let go of their old ways. Breaking the mould and getting employees and management out of their comfort zone is one of the humongous challenges faced by HR mangers. One of the way to make change easier for everyone is to show them what’s in it for them. Identify the early adopters in your organisation and drive the change through them. Once others see the success for these employees, they would want to adopt it too. How do you track employee productivity without breaching privacy? After all, your business outcomes are ultimately dependent on employee productivity. How to track employee productivity? There are plenty tools available for tracking employee work and impact. Work scheduler tools, GPS tracking and productivity summary sheets are some tools you can implement to track efficiency of your employees. Old attendance tracking applications have pitfalls and make accurate attendance a challenge for HR. There are many problems like buddy punching, proxy attendance and incomplete attendance data that HR have to tackle. How to track attendance accurately? Wi-Fi enabled attendance tracking systems can solve the problem here. These apps operate only within the company premise and also allow attendance for complete day to be tracked. Always choose an app that integrates well with your other softwares like payroll, appraisal and leave management etc. Check out WiFi attendance app and it’s features. Employee grievances must be given due attention at the right time. Not doing so often leads to attrition, office politics or even legal cases. These are tricky situations for HR and can poison the healthy culture of the company. Establish a grievance cell in your company that looks at employee complaints and feedback in a neutral manner. Encourage employees to route their grievances through this method. This gives issues a formal channel and keeps situation under check. Every executive level HR manager knows the number of daily queries that come from employees. These could be regarding leave management, appraisal, employee portals, employee policies etc. Answering them takes up a lot of time and leaves little time for core HR activities. How to tackle employee queries? If you segregate the queries based on topic you will see that most of the queries are repetitive. HR manager can remove the need for queries by giving clear instruction beforehand in portals or mails. Many companies are also using chatbots to answer these repetitive questions. Learning and career advancement are important for the millennial workforce. A survey by Bridge found out that offering career training and development would keep 86% of millennials from leaving their current position. Here the challenges faced by HR managers, is to know which training to give to which employee and implement proper learning cycles. How to assess training assessment need? The best way to find out is to ask the employees and their managers where they think they can use some training. There are also tests and tools available to identify training requirement of each employee. Perhaps the most stressful part of HR manager’s job is to deal with trade of employee unions. Not all industries will have these. But where they exist, negotiating work and compensation terms with these unions can be very tough. How to deal with employee unions? Maintain good relation with union leaders. There is no easy way to deal with this situation. Managing relation with trade unions is a matter of maintaining delicate balance or power. HRM is a major responsibility as it involves dealing with the dynamics of company resources. Human resource is the most complex as there is no one size fits all approach that works with it. There will be resilience pertaining to company policies and usual dilemmas and conflicts involving leadership unions. Meeting business goals will be a lot more easier once you catch up with the challenges of employment and leadership.